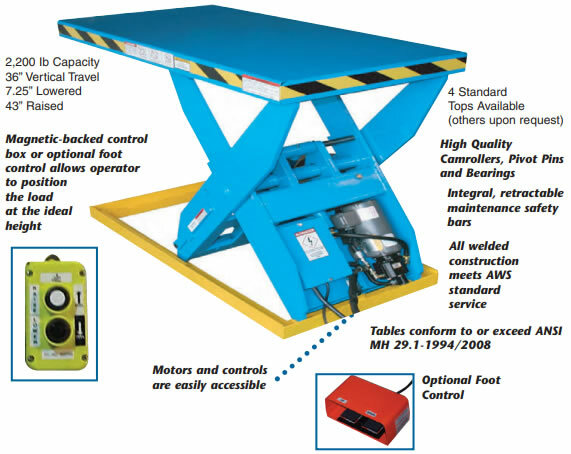 The best value in lift tables!  Internally mounted 1 HP 115 Volt TENV motor. 115 Volt operating control voltage. push button control station with 10 straight cord.  NEMA  1 prewired controls and electrical connectors. Control box contains contactor and control transformer.  Cylinders with internal stops.  Smooth steel top with yellow and black safety stripes.  S. A. E. hoses and fittings.  Integral safety restraint maintenance bars. total product. 90 days on electrical components.  Specifications are subject to change without notice. Special Top Sizes - Min 25" x 49"